My grandmother (we called her "Nana") taught me how to be a civilized human being. My failures in actually being a civilized human being are my own fault, not hers. Anyway, every New Year's Day, she would make Gumbo Z'herbes, as a way to put a New Orleans spin on the tradition of eating greens (e.g. cabbage) on New Year's Day. This is a lot more work than cooking some cabbage within an inch of its life, but it's worth it. 2. While the greens are simmering, cook the hot sausage (in small bite-size chunks) and diced ham or smoked sausage in a large heavy skillet. When cooked, remove the meat with a spoon, and put the meat on a plate. Drain off some of the grease from the pan, then add the onions and peppers. Cook until the onions and peppers are soft. 3. After the greens have cooked down, use a strainer to drain them, but retain the water (the stock) that the greens have been cooking in. Add the greens back to the large pot, and stir in the cooked onions, peppers, meat, bay leaves, and seasonings. Get the mixture nice and hot. Maybe this Christmas will be the start of some world-class developments. Mr. Clio, Dr. Mrs. Clio, Clio II, Clio III, Cliette, and Clio IV wish all the best to anybody who checks in with World Class New Orleans. 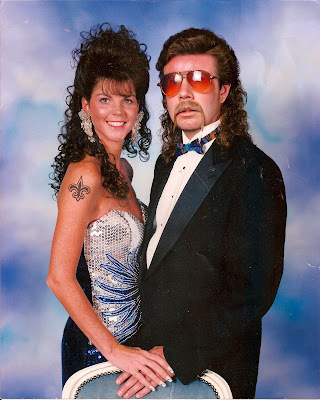 Thanks to Blake and Supa Saint for tear-inducing bit of joy below (Supa's prom pic from 1987). P.S. I had lunch with Chef Who Dat. What did I eat? The Black and Gold Burger, naturally. In the Holiday Video War, Are There Geneva Conventions? Because if there are, the 12 Yats of Christmas should be treated like noncombatants. Be sure to keep them (dem) out of this. P.S. Until I searched, I hadn't seen this, um, odd computer graphics version. Although it's tempting, please stay away from that too. UPDATE: Never mind about the P.S. I just watched the whole thing. I am entering it into battle in the war. Nobody should've touched the original WWL version. Yes, I know I'm no superpower like Greg, but this does make me laugh. 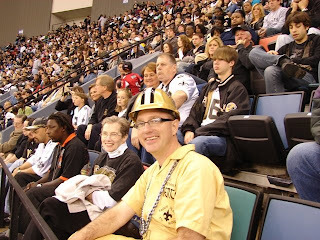 Does Coach Payton Read and Abide by the Yellow Blog? I mean, Coach benched Mr. Bush and then has been saying some snarky things about him. Jeffrey has got to feel vindicated by all this. I look forward to a 13-3 season next year. They have our number at Soldier Field. Also, Dr. Morris is clearly messing around with us. There's got to be a purpose to it. Note to Coach: Show you have some humility we don't know about. Hire an offensive coordinater. Fire Gibbs. Fire your special teams coach. Drew Brees, Smooth Colston, Pierre Thomas, Billy Miller, Mr. Ellis, Mr. Fujita, Mr. Vilma--you are the core of something good. Is there any doubt that Ashley Morris sent this snow to NOLA? I mean, we're playing the Bears tonight. I'm hoping this is an omen of victory. But then Ashley always did have a twisted sense of humor. What's it gonna be, Dr. Morris? When do we get to vote for members of our skin-color "communities"? Monday, I heard a WWL radio reporter say (with no audible laughter) that our new congressman, Joseph Cao, will be "reaching out" to leaders of the "African-American, Caucasian, and Hispanic communities" to let them know that he seeks to be everyone's representative. First of all, "reaching out" is one of those phrases that provokes only contempt and suspicious questions from me. You know, like "moving forward." If you have to "reach out," it probably means you've been improperly ignoring a person or people whom you probably should have been in contact with anyway. Second, who exactly would be the "leaders" of, say, the "African-American community" or the "Caucasian community"? In New Orleans, who exactly is "African-American" or "Caucasian"? My kids are a mix of everything. With which "community" do they vote? If someone sees pictures of Mr. Cao's meetings with these "leaders," please let me know. I'm frightened to see who will be representing the "Caucasian community." And I have a feeling they will be prominent members of clubs that don't look kindly on members of other communities joining. That doesn't sound representative to me, but it does sound like phony reaching out. P.S. Mr. Cao, if you want to keep my vote in two years, keep your distance from Steve Scalise. Jason David, You Have Earned It. As Humid Haney pointed out, you earned the right to do the Courtney Cox. When did we vote for the "leaders" of our skin-color "communities"? Yesterday, thanks to the generosity of a great friend of my employer, I was in a suite for the Saints' victory over the Falcons. Coincidentally, my suite was almost directly below my usual seats in Section 635 of the Terrace of the Louisiana Superdome. Thus, I was able to visit my usual section and people a couple of times. 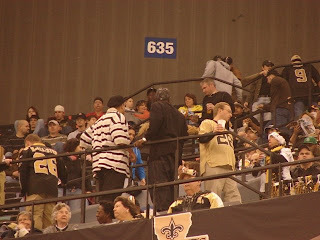 My suite was also two doors down from the suite for Reggie Bush's family and friends. In the course of the game, I saw Chris Paul. I saw Kim Kardashian. I saw and spoke with former Hornets and Celtics player P.J. Brown (who is a totally nice guy who in retirement has returned to our area to live). Meanwhile, when I visited the Terrace, I saw what you see in the pictures below. And I heard noise and love and camaraderie. I've written before about Adam Nossiter of the New York Times. He ALMOST gets it right frequently, and I often appreciate his work. However, now I have lost patience with his work. He seems to write things that subtly encourage New Orleans to be the old New Orleans that allowed bad federal levees to exist and passively accepted poverty and racism. The upset victory by the lawyer, Anh Cao, was thought by analysts to be the result of a strong turnout by white voters angered over federal corruption charges against Mr. Jefferson, a black Democrat who was counting on a loyal base to return him to Congress for a 10th term. I voted for Mr. Cao (and against my own Green Party). Guess what? I'm not "angered." I just want a congressman who is not on the take and who might get something done for our city in Congress. Nossiter needs old New Orleans; he NEEDS angry whites and angry blacks. He needs simple, passive, slow Southerners. We're so quaint to him. Why does he have to write stuff like this? Without them, he wouldn't be able to write. He'd have nothing to think about nor say. Let's not give Adam Nossiter anything to write about. P.S. Congratulations to Mr. Cao. Get to work, because we will all be watching these next two years VERY carefully. 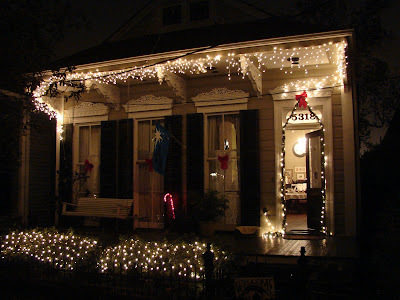 Brad Pitt is Right about "Benjamin Button"
It really seems to be a love letter to New Orleans. Check out the official website for "The Curious Case of Benjamin Button" and its riveting use of music and old New Orleans pictures. If you're lucky--New Orleans being the family that it is--you might even see one of your relatives or ancestors in the pictures. And I continue to be amazed at Mr. Pitt's and Ms. Jolie's ongoing commitment to our fair city. The health problems of Hurricane Katrina children are daunting. When the Children’s Health Fund, whose mobile health clinics have provided the only doctors and psychologists available to many of these families, reviewed the charts of children seen this year, researchers with the Mailman School of Public Health at Columbia University found that 41 percent under age 4 had iron-deficiency anemia — twice the rate for children in New York City’s homeless shelters. Anemia, often attributable to poor nutrition, is associated with developmental problems and academic underachievement. Forty-two percent of the children, who lived in trailers laced with dangerous levels of formaldehyde, had allergic rhinitis or an upper respiratory infection, the study found. More than half of those ages 6 to 11 had a behavior or learning problem, yet in the East Baton Rouge School District children can wait for as long as two years to be tested for learning disabilities. Honestly, reading this makes me ill. I think I'm in the wrong line of work. I'm fiddling while Rome burns. The change in capitalization and punctuation should indicate a difference in meaning this week. Note to Coach: your hubris will bring the end of you. Hubris does that. 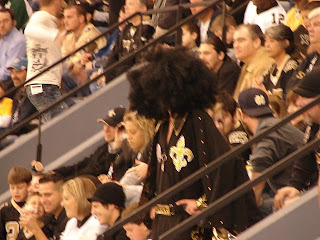 Like New Orleans as a city, the Saints don't need rockstars. We need blue-collar grunts. Pierre. Lance. Billy Miller. Shanle. Sit down, Reggie. Sit down, Shockey. We don't need "brilliant" idea hucksters either. We need roll-up-our-sleeves tenacity and leaders in that effort. So who are you, Coach Payton? Are you Ed Blakely? Or are you Bob Cerasoli, who is getting the job done (I've seen it first-hand)? I hope you're not Blakely, Coach.